Charles Dyer’s new book brings together two of my passions: the book of Psalms and the land of Israel. 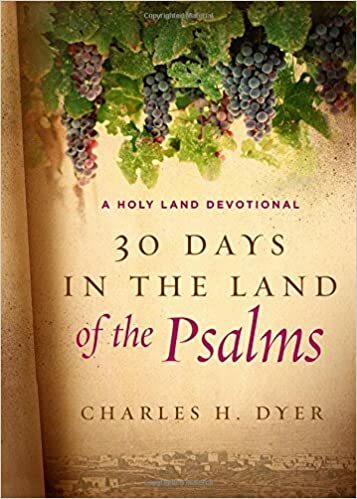 30 Days in the Land of the Psalms: A Holy Land Devotional is an attractive, compact, hardcover book that walks the reader through 30 psalms by showing how a knowledge of the land clarifies and deepens one’s understanding of the Psalter. In 30 days, you’ll read 30 psalms. Many of the psalms chosen are favorites for those who have spent time in Israel and Jerusalem, including 1, 22, 23, 46, 48, 84, 118, 122, 125, and 133. Each day’s meditation has one or more photos and concludes with an application. I’ve chosen two of his meditations to give you a sense for what you’ll read. Psalm 122 focuses on “the peace of Jerusalem,” and Dyer shows how David’s focus is on God’s selection of the city where the Lord would dwell visibly among his people. David called on the people to pray for both peace and security in Jerusalem so that they could continue to gather before the Lord. Dyer concludes by providing two ways that we can pray for the peace of Jerusalem. For the best tour of the Holy Land, you need the right guide. In this virtual tour through the biblical land of the Psalms, Charles Dyer is a trustworthy guide, providing sound Bible teaching backed by his immense knowledge of modern and ancient Israel. He provides a feast for the senses as he leads the reader from Mount Hermon through the arid wilderness and up to Jerusalem. This beautiful companion will open up the Psalms to readers in many fresh and delightful ways. I particularly recommend this devotional to people who have been to Israel and want to go back, as well as to those who love the Psalms and want to understand them better. Dyer has a related book that I have not read, but that you might want to take a look at: 30 Days in the Land with Jesus: A Holy Land Devotional. Either one would make a nice gift. One of the richest moments I had in Israel was in 1987, reading Psalm 84 while sitting at the Western Wall as the setting sun turned the stones a brilliant gold. The birds, perched in the spaces between the spaces in the large blocks, had, I was certain, some connection to those I was reading about at that very moment. Thanks, Todd. I ordered both books today based on your recommendation.